In issue 17 of Gotham Academy, I have a 3 page short story. 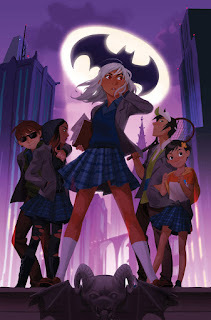 Rebecca 'Tay' Taylor, a former Mouse Guard editor =, now is in the Bat office at DC and knowing I was a fan of Gotham Academy, asked if I'd like to contribute a short story to the Yearbook arc (where students at GA are telling tales of past & present exploits at the school...those stories are drawn by guests, like I do with Legends of the Guard). While still thinking about doing it (I really really wanted to, but schedule was an issue) somehow my name was announced as a contributor on a panel at New York Comic Con before I'd committed fully. I took that honest mistake (plus my desire to be a part of it) as a sign that I needed to find space to do the story. 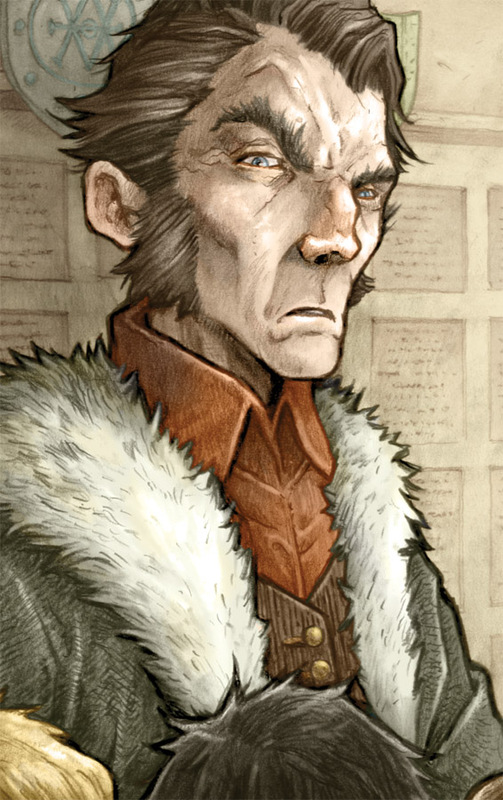 The only reservation I had (other than time, which did play a big part in the shorter nature of the story) was that I'm not fond of the way I draw people....or I at least struggle to draw them in a way I like. The Hogwarts RPG portraits I'd done not too long ago were examples of human drawings I was pleased with, so I set to draw the story that way. 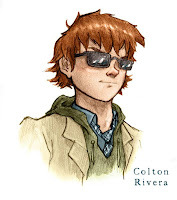 And as a test, did a sample character study of Gotham Academy Student Colton Rivera. 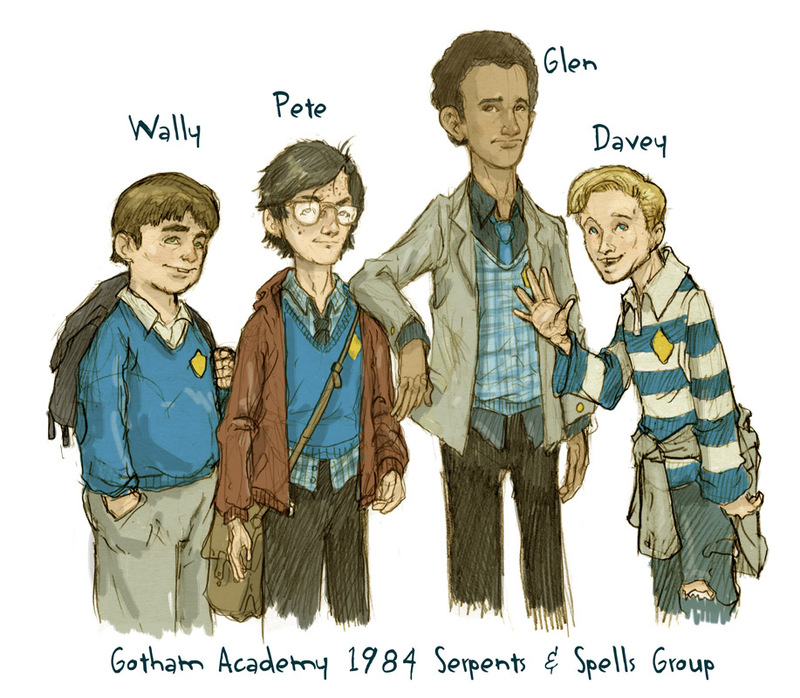 For my story though, I decided I didn't want to use any of the existing Gotham Academy cast, and thought I'd introduce four students from the school's past. I based the quartet on myself and three close friends from my younger days. These are the guys I first started making up stories with, making home movies with, and roleplaying with. 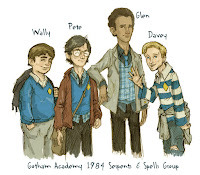 Nicholas Kowalcyk became 'Wally Adams', David Petersen became 'Peter Erikson', Jesse Glenn became 'Glen Thomas', and Mike Davis became 'Davey Kurtz'. 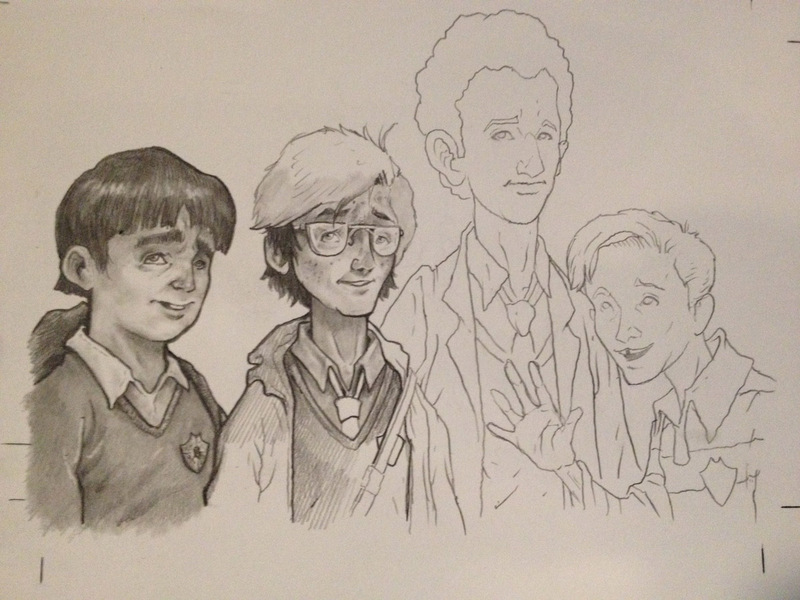 These four would be playing GA's answer to D&D 'Serpents & Spells' at the school in 1984. Last year I visited a private academy in New Hampshire to speak to their art students (You can go back and see a whole blogpost about that trip here). 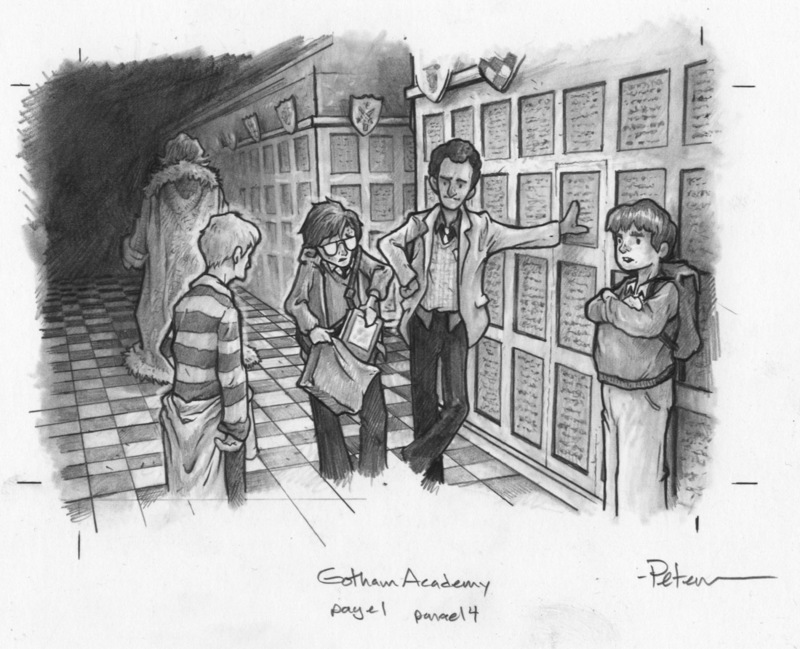 It was the practical place I envisioned when I tried making up a story at Gotham Academy. 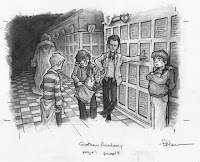 And the tradition of the graduates' names being carved into the wood paneling of the hallways (which you swipe with your finger if you pass a relative's name) was something I had to incorporate into my drawn version of Gotham Academy. 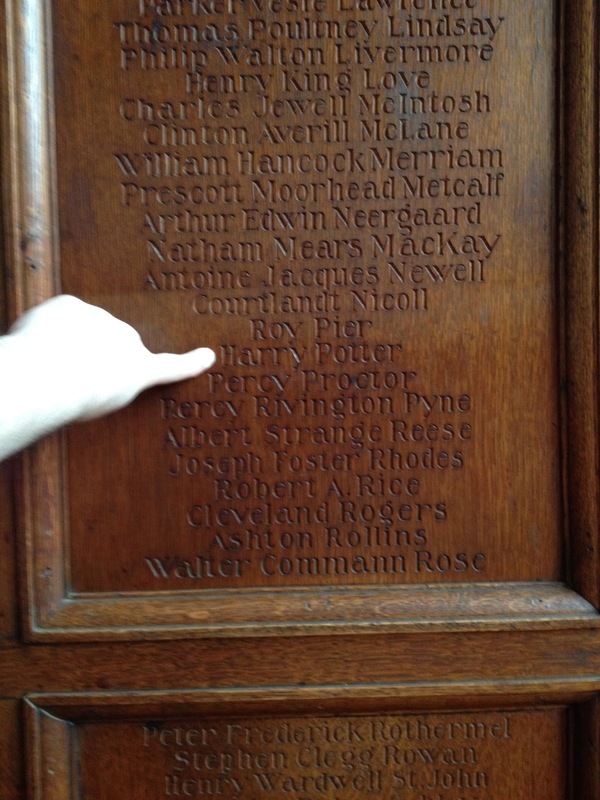 (Here I'm pointing at a 'Harry Potter' from a turn of the 20th century list of graduates). To make life a bit easier, I made a little model section of the hallway at Gotham Academy (c.1984) where we first meet our four S&S playing students. 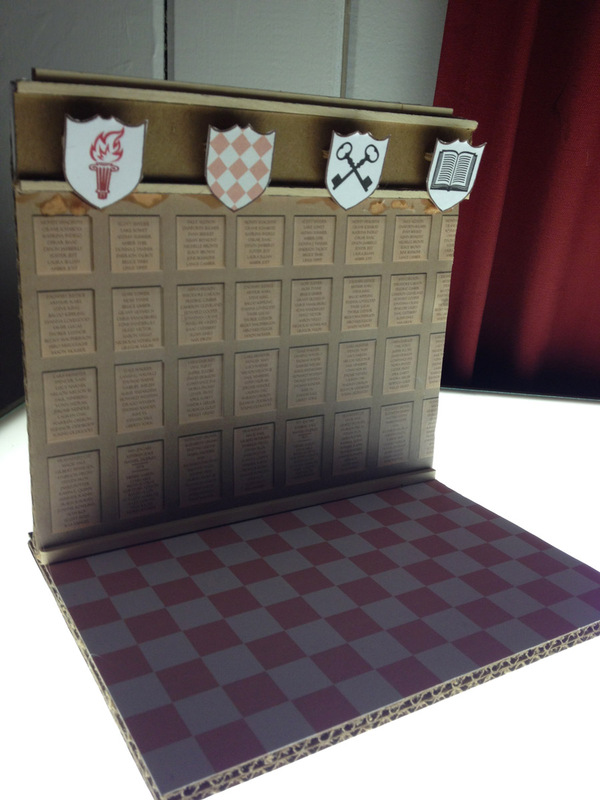 It looks rather complicated of a model, but it's really just two pieces of cardboard glued together with printed out images glued to them. The printouts were stock photos of tudor wood paneling, and a checkerboard, and I added tome text for the carved names and cut out some little shields to glue on along with some thin wood stock for trim. Tay, of course, needed to see what my pages would look like, so I roughed out my story with something more detailed than thumbnails, but rougher than I'd pencil a Mouse Guard page. I won't share any full page's thumbnails, because with only 3 pages, I don't want to share too much of anything. I also wrote the script as I roughed out my story beats and panel shapes. 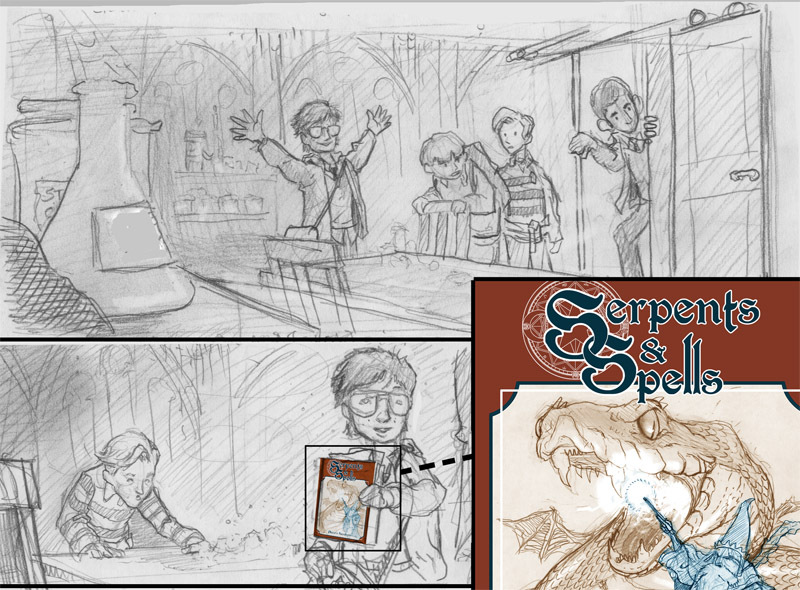 To the right is a few panels from page 2. 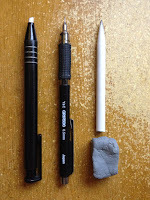 Rendered pencil can be messy, and if you make a mistake, erasing can be tricky. Because of this, I opted to draw each panel separately. This is a technique suggested to me by Cory Godbey. 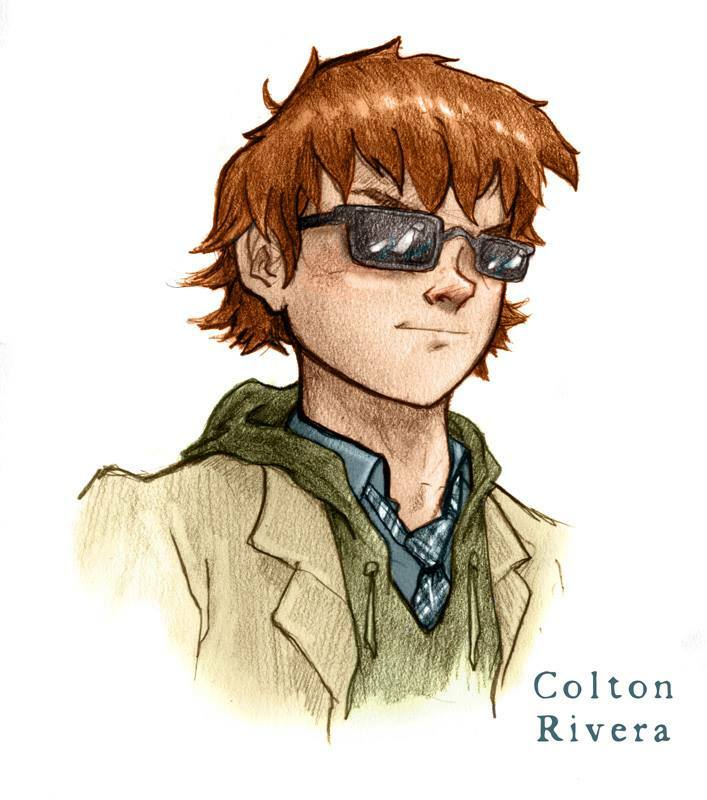 Cory also sometimes draws the characters apart from the background, but I only did that on two of my panels and didn't take to it as much. On the left is an example of me tightening up the pencil outlines on bristol, while my rough/layout is underneath as a guide on my Huion light pad. After I have solid outlines, I can start adding all the subtlety of tone and texture. 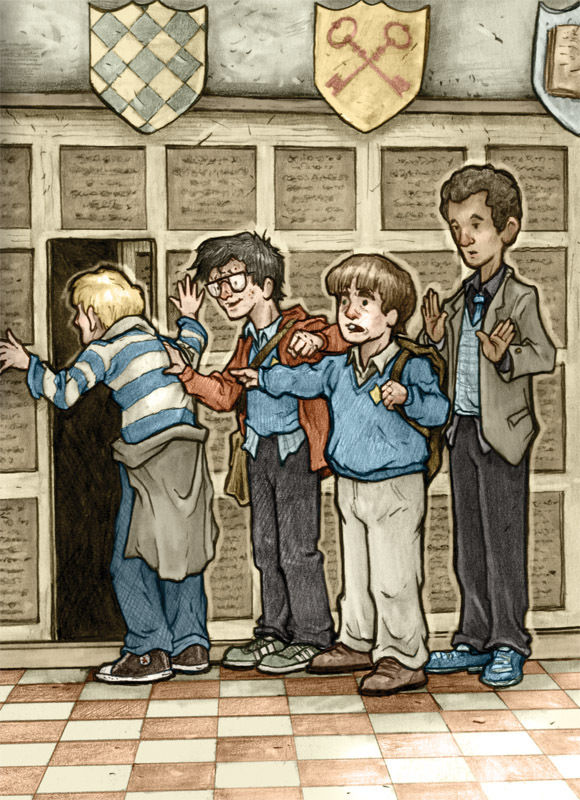 I re-used the first character designs when drawing this panel of the four S&S players (who've given themselves the nickname 'The Gilkey Warlocks'). I tended to render from left to right so that my hand wouldn't smudge the finished parts as I worked, but sometimes I'd lay down a sheet of paper just under my hand to protect the drawing as I worked anyhow or when I couldn't just move L-R.
Tool-wise, I'm not using anything fancy. 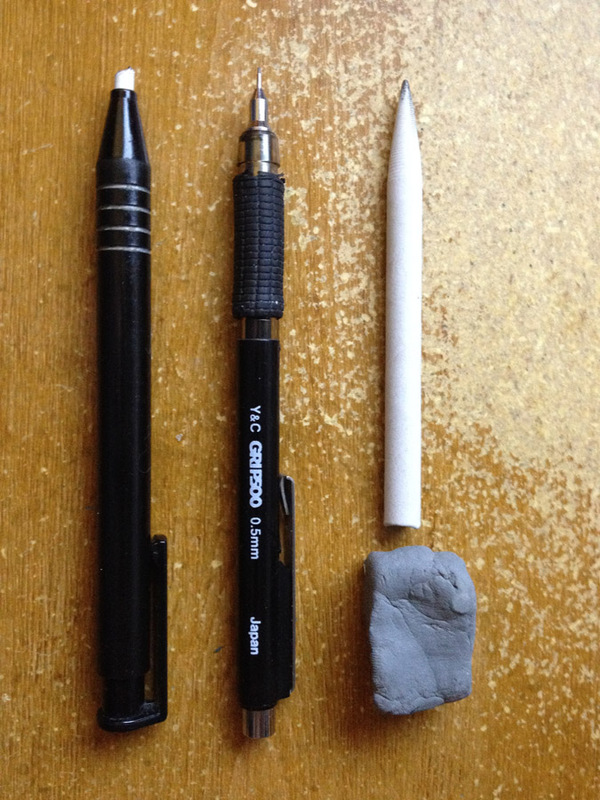 Knolled here are my (L-R) Stick Eraser, Mechanical Pencil (0.5 w/ HB lead), a Tortillon (fancy word for a smudging stick), and a kneaded eraser. At times I did break out a softer lead pencil to make some really dark areas quickly, but most of the 3 pages was drawn and rendered with what you see here. It's also of note that I went through 3-4 Tortillons doing these pages. 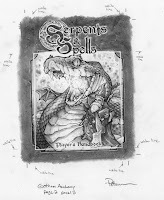 I had to call Tay and ask if there was an official Serpents and Spells rulebook cover or logo. She said that no one had tackled it yet. 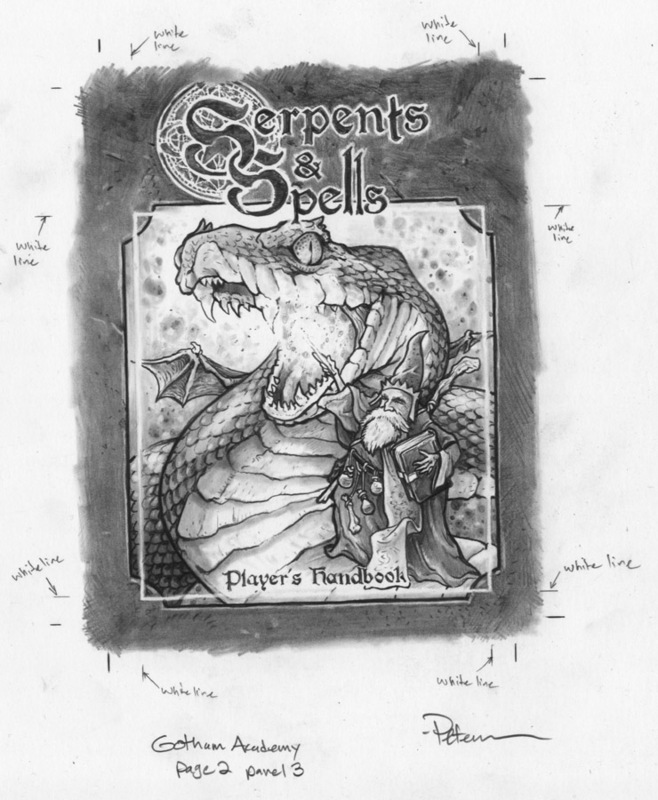 So I went about designing my best old D&D player's handbook homage and logo (making the S & S interlink as the focus instead of the ampersand). The book's cover is a full panel in the story and here to the right you can see it uncropped along with notes to myself for where the panel ends and where to make sure the lighter details go. Here is one more finished rendered pencil panel of the characters in the hallway. I scanned all these panel pieces made some adjustments to get the right light/dark balance and then re-assembled them all in Photoshop according to my layouts. 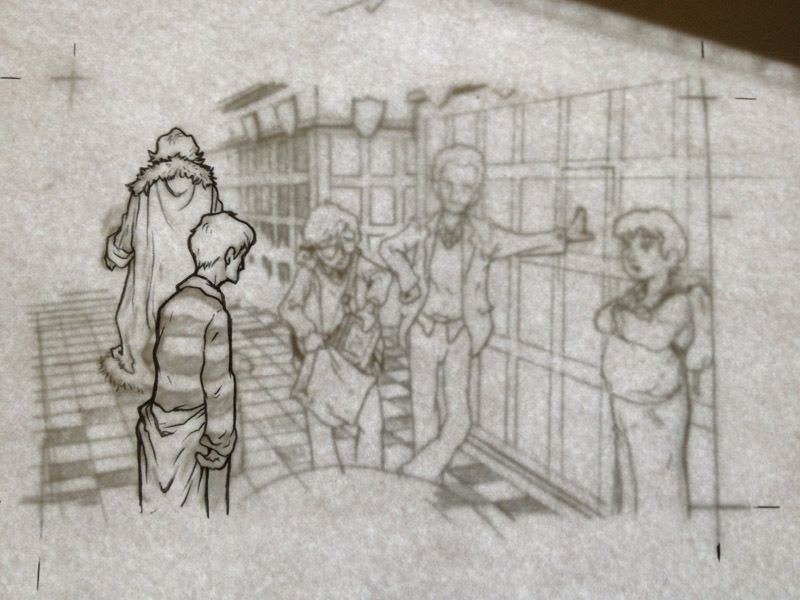 For the panel borders, I drew those in with the line tools in Photoshop. Color! 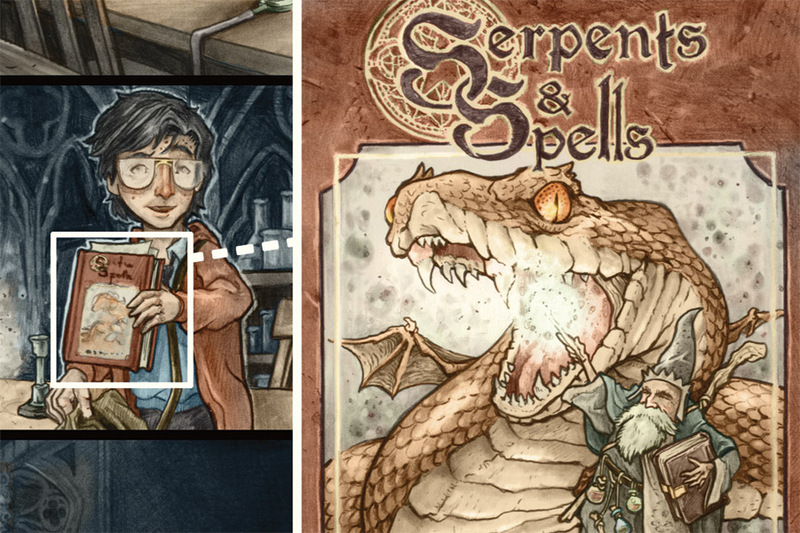 Just like the Hogwarts drawings, these are colored in a way different from my usual method for Mouse Guard work. 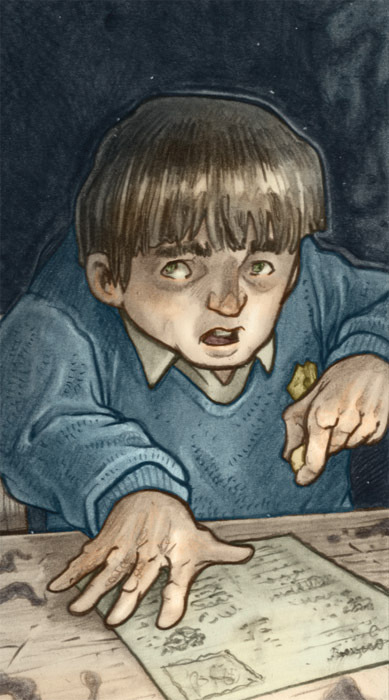 Here the color layer(s) all go on top of the rendered pencil and each of those is set to layer mode 'color'. This means that the brightness and darkness is determined by the rendered pencil layer, but the hue and saturation are determined by what I pain on the color layers set to 'color' mode. 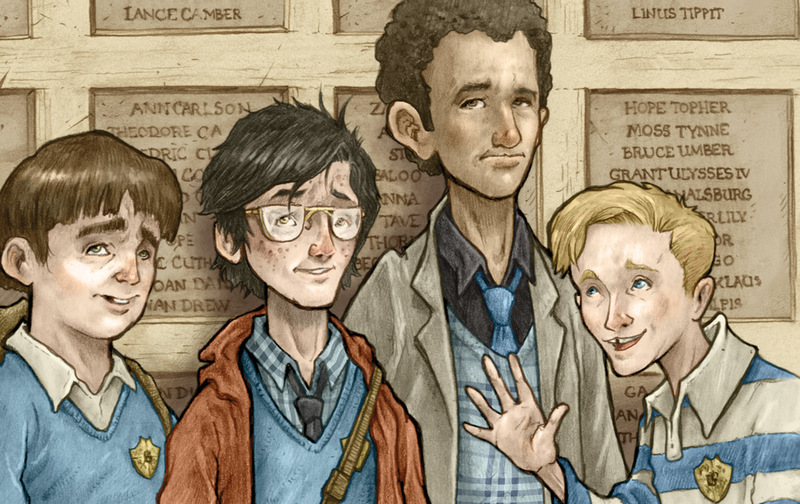 It’s the final chapter of “Yearbook”! Maps and Olive now have the entire gang involved in putting together the perfect yearbook—but which story will come out on top? 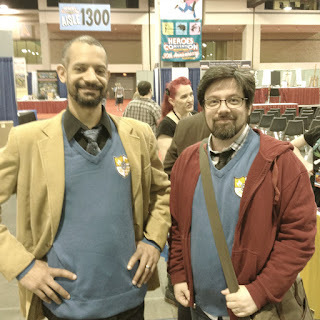 With art and story by Eisner Award winners Faith Erin Hicks (Adventures of Superhero Girl), David Petersen (Mouse Guard), and Michael Dialynas (The Woods)! Cover by Mingjue Helen Chen. Re-Run Usagi Yojimbo pinup for the Sakai Project.